The Pinterest pin for this DIY idea is one of our most popular ones, getting shared thousands of times. 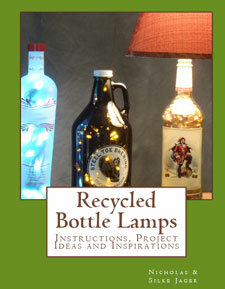 We decided to make this easy, illuminating craft project to share with you. A couple of weeks ago we went to tour the Jack Daniel Distillery in Lynchburg, TN with our friend Mark. 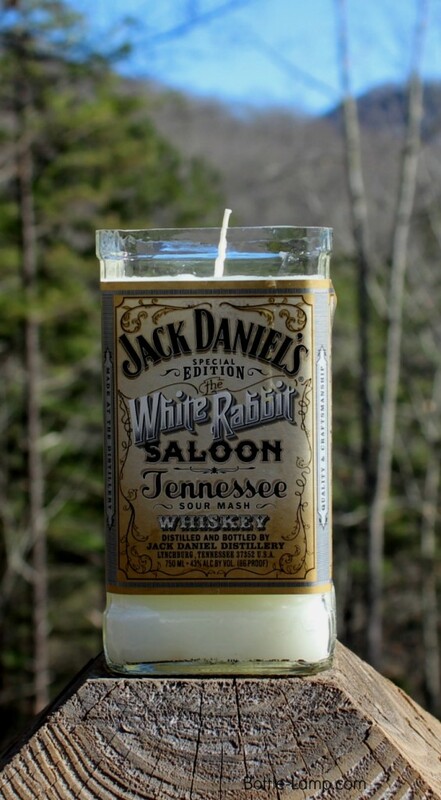 He bought a bottle of Jack Daniel’s Special Edition ‘The White Rabbit Saloon‘ Tennessee Sour Mash Whiskey that is only sold at the facility in Lynchburg. We helped Mark drink the whiskey (which was very good by the way) while he was visiting us and decided to give him the empty bottle back in the form of a candle, as a keepsake. Scroll down to learn more about this one of a kind whiskey. I have used the Creator’s Bottle Cutter for quite awhile now. It is easy to operate and very reliable. With that said, this was actually the first time I scored a square bottle. Our friend Ray put together a really good video ‘Square Bottle Cutting 101‘ describing the process and I simply followed along. Running the score line over the square bottle turned out to be rather easy. 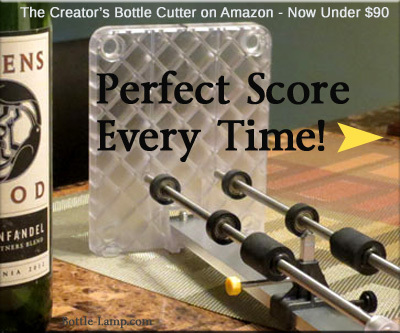 With the bottle cutter set in the up-right position, I simply moved it around on the base platform until I had come full circle. 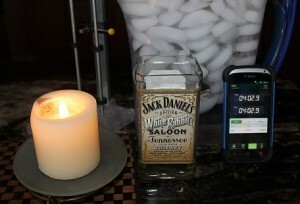 With the bottle scored I went ahead with the separation process using the hot candle and cold water shock method. Using this method rather then running hot water over the bottle was necessary to avoid getting the label wet. The label is what makes this bottle so unique and the fact that our friend Mark was with us made it even more of a keepsake. The separation was nice and clean but I wanted to give it a nice finish. With the Saber Tooth sanding pads I was able to give it that nice polished look in no time at all. 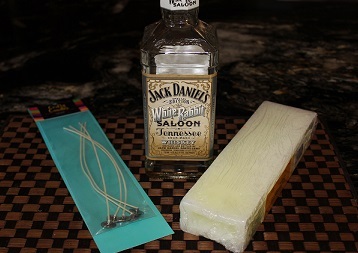 Once the lip of the Jack Daniels bottle is nice and smooth you can begin with the candle making part. Use a double boiler to melt the wax. 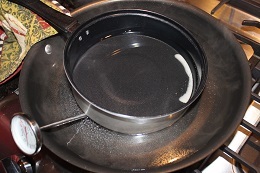 We found an old pot for $.50 at a second hand store and placed it inside a big frying pan filled with water to melt the wax. Use a thermometer to make sure the temperature of the wax doesn’t exceed 200 degree F. Once the wax is melted you can add candle fragrance if you want. We didn’t have any on hand, so I thought we could add a little Bourbon Vanilla Extract. Well, it didn’t work, the vanilla just kind of beaded up in the wax, so be sure to use the proper stuff. To hold the wick in place we used a small amount of super glue in the bottom of the bottle, that didn’t work either. Once we poured a small amount of hot wax into the bottle, the wick became loose again and we had to hold it in place while the wax was cooling. 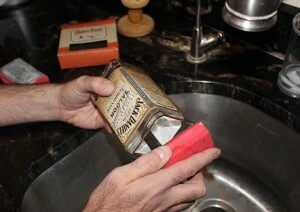 We slowly poured the rest of the wax into our Jack Daniel’s bottle. Again we had to hold the wick so it didn’t collapse into the hot wax. This part was a bit of a pain! 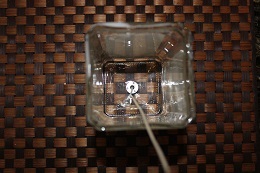 Maybe attaching the wick to a stick or something, and letting it dangle into the bottle from the top would work better? We will try that the next time we make a candle. The end result turned out very nice! 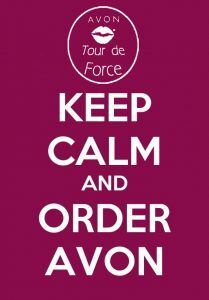 One more tip… if you use a 750 ml bottle like you see in these pictures, be sure to have extra wax on hand. 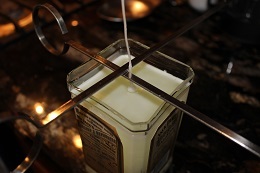 Once the wax cools and dries, the wax will shrink and you’ll end up with a concave on the top of your bottle candle. This can easily be filled in with a little more melted wax. Mr Jack Daniel was known to have a taste for a well-told tale and the company of good friends. They’re some of the reasons why he owned the White Rabbit Saloon on Lynchburg’s town square. The saloon was a favorite Lynchburg gathering place where he and his friends could spend time together and enjoy a glass of Mr Jack’s fine Tennessee Sipping Whiskey. The free tour at the Jack Daniel’s Distillery is very informative, but doesn’t include a tasting. You do get to sniff the whiskey after it went through the charcoal filtering though. Be sure to stop in if you’re ever in the East Tennessee area and pick up your own bottle of Jack Daniels White Rabbit Saloon whiskey. 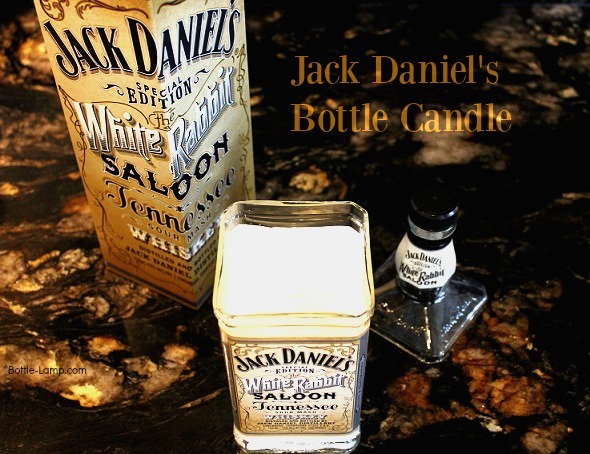 We hope you will give candle making a try using your own cut Jack Daniel’s bottle! 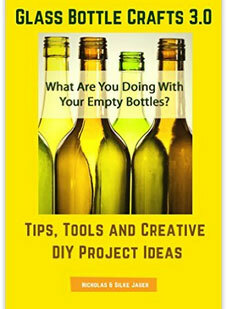 They make great gifts… and remember to share your DIY Show Off’s with us and our readers. 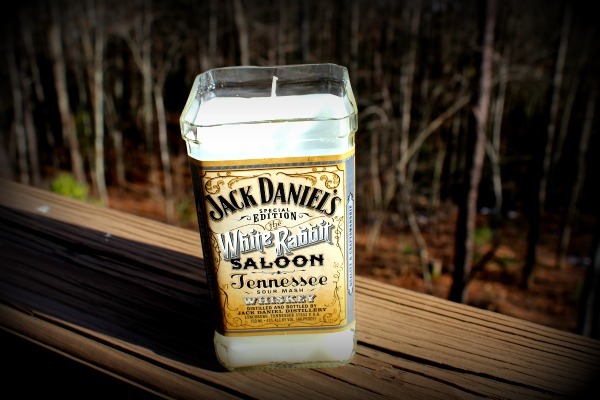 What do you think of our Jack Daniels candle? Leave us a comment below. This is so cool! Where did you get the wax? The craft store price seems steep. It would make the cost of the project go over board. We purchased the wax at a local craft store. I didn’t compare prices. You might be able to find it cheaper on-line. I only submersed the top of the bottle past the score line. Be sure to give it enough time to make the glass separate. Candle is cool. Jack Daniel’s is trash can whisky.